Whew, what a week. Not only has the Star Wars world changed as we know it, with the release of The Last Jedi, but the newest and most endearing character added to the saga has been featured in a new book, Cobalt Squadron. 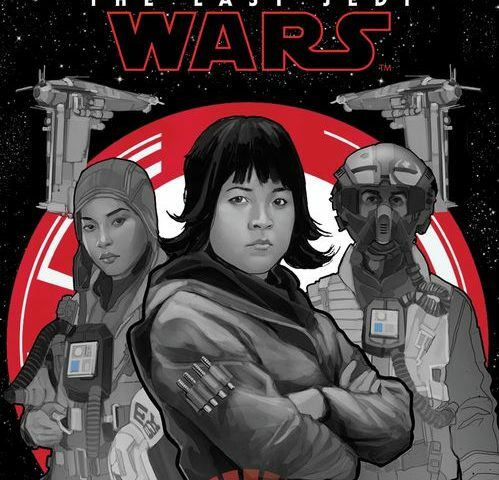 Written by Elizabeth Wein, we are given a special bonus with this book as the narrator is none other than Rose Tico herself, Kelly Marie Tran! As you will hear soon in the movie review podcast, I found Rose Tico to be joy personified. I cannot help but smile when she is on screen. She also holds the distinguished honor of delivering the most incredible line of dialogue in the movie, “That’s how we’re going to win. Not fighting what we hate. Saving what we love.” Uh, straight to the heart! Let’s talk about the book. The majority of this story takes place before The Force Awakens. Page and Rose Tico, along with Cobalt Squadron, the bomber squadron featured in the beginning of The Last Jedi, make attempts to deliver supplies to a planet that is being oppressed by the First Order. As the story unfolds we get a deeper look into the relationship between Rose and her sister. During this series of supply runs Rose begins to gain more and more independence. All of this is foreshadowing for The Last Jedi. Toward the end of the book the events of The Force Awakens take shape. Capped by a strange solar flare which turns out to be the destruction of the Hosnian system. The book concludes with a new assignment……and the rest is now history. I really loved this book. Probably because the opening scene of The Last Jedi is my favorite scene in the new movie. WWII style bombers are given the name, “Fortress”, an homage to the “Flying Fortress”, B-17 Bomber. The conversations are pretty much kept within the squad so you get an idea of the staff and leadership structure within the squad. Kelly Marie Tran’s performance in narration is on par with all of the other new narrators. Star Wars audiobooks continue to bring quality one project after another. The music seemed less sparse than other releases, which only pushed Tran’s voice more to the forefront. If you love Rose Tico like I do, or if you enjoyed the beginning of the The Last Jedi like I did, I would highly recommend this book! May the force be with you!